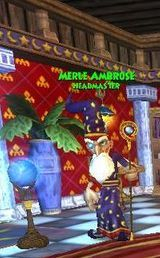 Merle Ambrose is the founder of Wizard City and he's the headmaster of Ravenwood Academy which was built around the great wise and old tree, Bartleby. We first meet him in the tutorial and we get to see his younger self in Ghost Avalon. There where we find out that he came from Avalon and why he created Ravenwood Academy as well as that he was the former teacher of Young Morganthe. He loves to read old musty tomes, but does not like to discuss his birthday since he's quite advanced in his years. Merle is a reference to the Merlin in the old story of Arthur and the Round Table. Gamma is a pet owl too smart to be sitting all day in Headmaster Ambrose's house. He has studied very closely and thoroughly at the Spiral and its magical workings. You may not have known this, but Gamma is the one who chose you to fix the Spiral and learn at Ravenwood School of Magical Arts. Gamma also helped us sneak into Ghost Avalon by helping us transform into him and catching Young Morganthe in her tracks. She is a fancy lady whose hairs sticks up in which way to represent a flame or a fire which is the school she teaches her pyromancers at Ravenwood School of Magical Arts. She likes soft jazz and hates casual wear (Go figure!) Quests tell us that she originated from Avalon and is an elf, but if she is an elf, how did she gain her height? Some people also think that she is loosely based on Minerva McGonagall from the Harry Potter stories. Lydia Greyrose is a Ice School magic teacher at Ravenwood. She is also a fairy from the magical world of Candy World (We've all played that game right?) Her homeland had cookie roads, chocolate rivers and candy cane trees. She is the youngest of three sisters, but alas she is only a half-sister to the other two. This is why she has fairy wings while her sisters don't. Although she is nice her sisters are very evil and live in gingerbread homes, and cooked up a army of gingerbread minions to aid them in continuing a tradition of children-cooking! Her being half-related probably made her good in comparison. She learned ice magic to put out the fire (Don't tell Professor Falmea) that burns the pot cooking the children. She likes cookies and hates tardy students. She's a flower loving bovine from Mooshu who teaches Life Magic. This position was formerly held by Sylvia Drake. Cyrus Drake is the Myth Teacher of Ravenwood Academy (Let the hatred begin.) He generally hates newcomers and even wanted us to get expelled! He has a brother, former death teacher, Malistaire Drake, who we defeat to end the chaos he has started. Cyrus is on the good side (believe it or not) but he likes only quiet and research and dislikes anything besides it. He also likes Sushi. 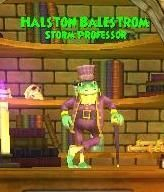 Halston Balestrom is a very excited frog that teaches Divination in Ravenwood Academy and is a master inventor. He is thought to be from Marleybone (Remember those street sweepers?) but could have learned divination in Marleybone with the group that is on the expedition to ancient land of Celestia. He loves fashionable hats but hates patent officers. Alhazred is a well respected, important elder of Krokotopian society. He is the new balance teacher of Ravenwood students once they reach Krokotopia. He teaches in a classroom beneath the Krokosphinx. He is part of the Order of the Fang similiar to the Council of Light. Alhazred in literature is Abdul Alhazred, writer of the Necronomicon (See the connection?) He is not directly part of Ravenwood staff but IS the balance students proper teacher. 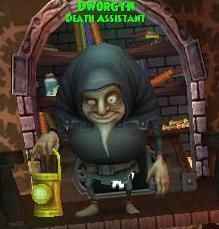 Dworgyn took over the position of Death teacher after Malistaire abandoned his post to find a way to bring back his wife who passed away. Some people mistaken him for a her, so don't call him ma'am. He released a Halloween quest early, oh Dworgyn! He is a crane that is the registrar in Golem Court that handles your training points buybacks and Academy enrollment. He loves backgammon and hates turtlenecks. 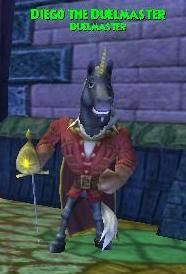 Harold Argleston is the Head Librarian of the Wizard City Library. He adores books and rare antiquities obviously. And if you travel quite far away in the spiral, you will have a chance to bump into his relatives who are quite informative due to their librarian legacy. He also penned an book titled "An Annotated History of Ravenwood School." Diego Santiago Quariquez Ramirez III is located in front of the Arena in Unicorn way. He tends to give us tutorials on new tactical fighting methods like how to use Critical and Blocking. He came from Wysteria and when we visit his home world, we do encounter a portrait of him at a young age there. In addition to that, we get to meet one of his relatives, Benedict Glendemming, who introduces us to the Pigswick Tournaments. Diego adores Ballroom, Salsa and Flamenco dancing. But he does not like cheaters and poor manners. He advocates good sportsmanship!